Did you know that Jamaica is the only country that has given the world 8 (!) distinct genres of music in the second half of the twentieth century? As soon as you press play on Richie Stephens' new album Root Of The Music, you do! The artist mentions Nyabinghi, Mento, Rocksteady, Ska, Reggae, Dub, Dancehall and Raggamuffin on the first and title track, and together with The Ska Nation Band, he is digging deep indeed! From citing The Beatles' Norwegian Wood (that became a major hit in Jamaica in 1967/68 when sampled by Jackie Mittoo & The Soul Vendors' in Darker Shade Of Black) in the first track via covering Italo-Pop-Classics like Volare to a marching-band-version of the Jamaican national anthem, the Italian producer duo Papa Leu and Rankin Lele (Adriatic Sound) joined enthusiastic forces with Richie to create a new livication to the music they all love. After their album Internationally (released in 2016), they continue the successful marriage of Jamaican musical heritage and Salentian instrumental craft with this release, and the Ska-beat inherent in the band's name is given full room to unfold, as reflected in You Can't Run Away, Down Town or Give Thanks. In Nobody Like You, however, I almost wish it wouldn't switch into this fast tempo after the first 40 seconds, because the track starts so beautifully calm and soulful. Featured singer Tammi T, a fellow Jamaican who, together with Shelly Ann and Paola Pierri, provides the backing vocals for the album's songs, can again be heard in the cover Ti Amo, a song especially the soli parts at the end of which are fun to listen to. Interesting also the old Neapolitan classic 'O Sole Mio vested in a Ska dress, a version released as single about two years ago. Country Bus sounds different than the rest? Yes indeed, reason being that this song is played by an original Jamaican group called Rod Dennis Mento Band, recorded at Penthouse Studio. Would that I could invite them for my next birthday party! Only two other pieces are not played by the Italian band consisting of Leo Klaus (bass), Luca Manno (sax), Antonio Fossa (drums), Andrea Perrone (trumpet), Morelloo Selecta (DJ), Gianluca Ria (basso tuba), Otty Lewis (keys), Gaetano Carrozzo (trombone), Giancarlo Dell' Anna (trumpet), Maestro Garofalo (keyboards) and the producers themselves, Papa Leu and Rankin Lele: one is Joy featuring Toots Hibbert, a track laid down at Richie's very own Pot of Gold Studio in Kingston, the other is the evergreen Black And White recorded at the famous Tuff Gong Studio. Despite a powerful performance by Bounty Killer, the excitedly announced Bad Boys In Town is a bit disappointing musically. More stars align in the next track: Mutabaruka, Cocoa Tea, Romain Virgo, Freddie McGregor, Ed Robinson, Louie Culture, Ninjaman and a fantastic Wayne J (watch this yute!) join in Richie`s plea to say No GMO. 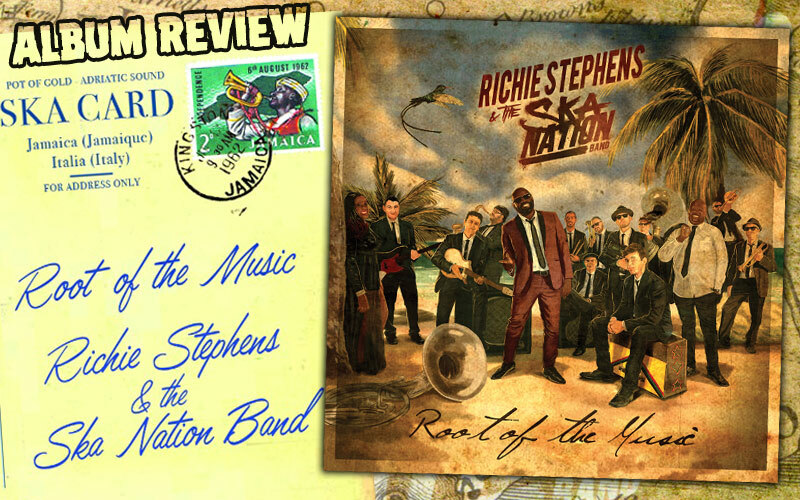 With Root Of The Music, the full force of Richie Stephens and The Ska Nation Band propels us on a musical journey that takes surprising twists and turns and leaves me with a desire to visit Salento, the most Jamaican region of Italy.